This stock is for a custom .22 rimfire rifle to shoot in competition. The goal of this type shooting competition is to fire 25 shots at 50 yards. Each target has 25 bulls and several extra bulls for sighter shots. The shooter is trying to hit a target the size of a period at the end of a sentence at 50 yards. 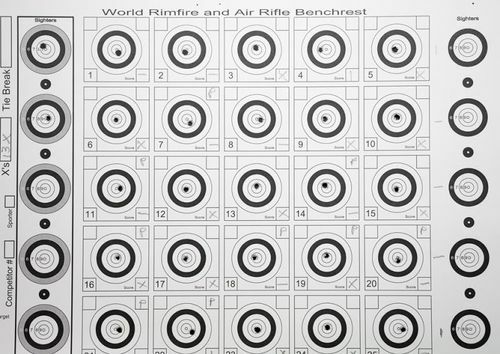 Try it with your 22 rimfire rifle sometime… If you want to improve your scores, I’ll carve a benchrest stock for your rifle. Always enjoy your stocks. They are beautiful works of art and so much nicer to the eye that the “black” plastic stocks. Thanks for sharing. You never cease to impress. Nice stock! I know that bullseye wll. I shot three years of three position .22 indoor in college. The nine ring was just a thin halo when the perfect shot was made. Our table of fire was sixty scored shots, 20 each prone, standing and kneeling. Keep em in the X ring. Good work on these stocks. Hal, Very Nice, the laminated approach should keep it stable. Is the rough inletting for a 40x? Shoot me an email or pm, seriously in need of another stock. 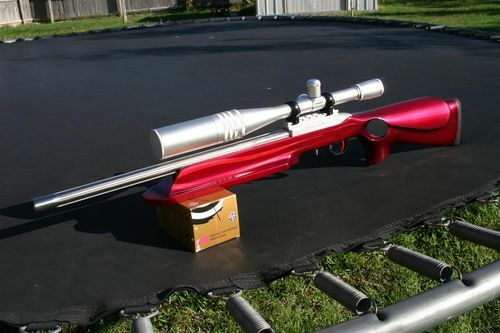 At first your targets were faulty, because the bull were off center…....lamo. Do they score on points? Is the dot, the ten ring or X? I built a Sporter class B/R rifle(10 1/2 Pound weight limit), starting with a pattern very similar to this. When finished the stock weighed 2# 4oz! Much triming and hollowing. The target was one I found on the web to show everyone what a .22 rimfire match target looks like. Centerfire benchrest targets have a single bull and they shoot a 5 shot group with a moving backing so the score keepers can see they fired all 5 shots. Here’s a target I made a few years ago for a commercial website. It’s got a single pixel for the sighting point and a square box to line up your crosshairs and a vertical line with 1 line crossing the vertical like 1 1/2” high and another line crossing at 2 1/2”. I use it to sight in at 100 yards. I sight my 22-250 and .243 to shoot 1 1/2” high at 100 and that puts me dead on a 250 yards. The original target is on my website so I can print a target without looking for the disk the file is hidden on. I’ve got a ruger 10/22 that I’m betting will do that. I’m not sure I can anymore, but thats another story. That’s a very nice stock. I love walnut and cherry together. I’ve made a few plane knob and totes with the mix, but I wonder how it will be once the cherry darkens with age? DonW, when the 10/22 first came out, I was told that the Naval Academy modified them for competition. I have one that is very accurate. I also ran across a website that had a bunch of target patterns you could download and print for nothing. Can’t remember it now. Keep them locked up and secure in steel. Hal, Here’s one of my 10/22 rifles, slightly modified laminated birch/maple stock – It shoots pretty good. Another Beauty . What’s NEXT ? Very nice! I never would have thought of such a stock. But then, I’m only shooting around 188/200 with a Ruger K10/22T (10-shot semi-auto), the one with the 12-sided stainless barrel with the twist. I’m going to have to buy some real ammunition (like Wolf or something) to get to the Distinguished Marksman level. Cheap hollowpoints don’t get it. Is that 10 ring about 3/16” in diameter? I use A-32s, that’s what is is on them. I’m getting too old for open iron sights, even at 50 feet. Combining fine woodworking and guns.. I like it! WOW, really nice stock. When I was in college I worked doing odd jobs, and on occasion I worked with a gunsmith who made custom bench guns. I did stock fitting, floating barrels, and some bedding jobs. Your photos bring forth some great memories, although I never did anything close to your fine work. Gorgeous stock. I cant wait to see others.